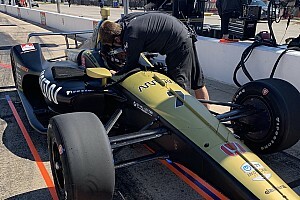 The race almost immediately went under yellow when Graham Rahal made an inauspicious start from 18th on the grid, tagging the back of Spencer Pigot’s Ed Carpenter Racing-Chevrolet as he tried to make an early getaway. He broke the front left wing of the Rahal Letterman Lanigan Racing-Honda and spun the ECR car into the inside wall, while bouncing his own car off the outside wall. Pietro Fittipaldi also broke the front wing of his Dale Coyne Racing-Honda on the back of the other ECR car of Ed Carpenter. Under yellow, Carpenter, Conor Daly and Max Chilton stopped, along with Rahal. 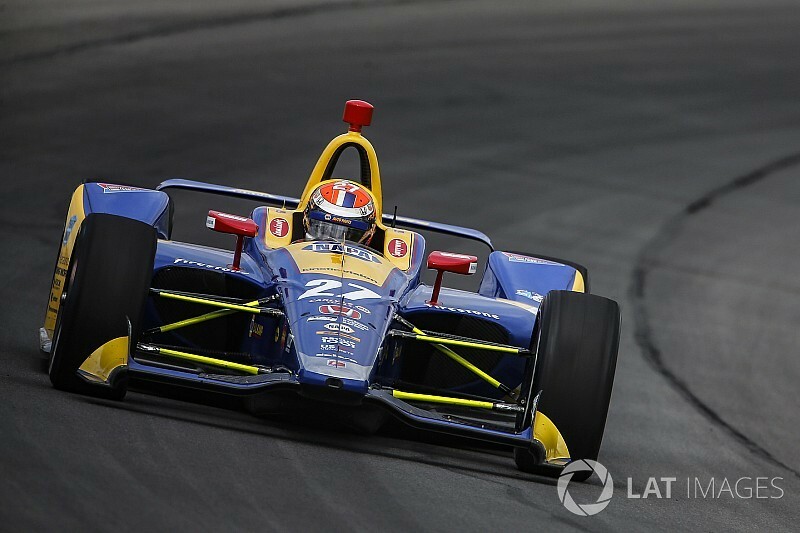 At the restart, Alexander Rossi jumped his Andretti Autosport-Honda ahead of Will Power’s polesitting Team Penske-Chevrolet, as Robert Wickens moved up to challenge Ryan Hunter-Reay. However, through the Turn 2 kink, the front-right of the Schmidt Peterson Motorsports-Honda made contact with the side of the Andretti machine, spinning Hunter-Reay into the wall and triggering a viciously fast spin along the top of the SAFER barrier for Wickens exiting Turn 2. That tore up the debris fence, and shredded large parts off the SPM car. Hinchcliffe applied full opposite lock to spin and avoid his teammate and hit the outside wall, but his efforts to lessen the crash were nullified by a heavy secondary impact from the out-of-control Fittipaldi, ending the race for both drivers. Takuma Sato in the second RLLR car was sprayed with oil, struck the wall and his car was retired. Rahal’s would restart albeit many laps down, as a result of damage repair and a penalty. However, eventually Bourdais did get back in his car. Under the last lap of yellow before the restart, the two Chip Ganassi Racing-Hondas immediately stopped, the cars having been untouchable under red-flag conditions. Jones took on a new front wing but lost a lap, Dixon, as a precaution, took on new right-side tires as he’d driven through the Wickens debris. Simon Pagenaud also stopped to have front-right suspension repairs on his Penske, but like Dixon, returned to the track still on the lead lap. Thus the front runners would restart in single file in the order Rossi, Power, Newgarden, Zach Veach, Sebastien Bourdais, local hero Marco Andretti, Carpenter, Tony Kanaan and Matheus Leist (both AJ Foyt Racing). At the drop of the green, Rossi sprinted into the lead as Veach tucked in behind the two Penskes, with Andretti passing Bourdais for fifth, while Dixon was into the top 10 by Lap 14, just two laps after the restart. Kanaan had to pit almost immediately, elevating Dixon to eighth, and Leist to ninth, while Pagenaud was already into 10th. Rossi had pulled a six second lead over Power by the time he pitted on Lap 38, and Power, Newgarden, Andretti, Veach and Bourdais stopped a lap later, with Carpenter getting service on Lap 40. That left Dixon out front, having taken on fuel during his pitstop before the restart, but Dixon then took on fuel on Lap 42, handing the lead back to Rossi, who now had 7.5sec over Power, who in turn was 4sec clear of Newgarden. Bourdais had managed to split teammates Veach and Andretti to run fifth, while Dixon was still eighth, trailing Carpenter. 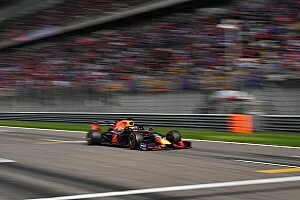 Stuck behind backmarkers – Conor Daly’s Harding Racing-Chevy and Max Chilton’s Carlin-Chevy – Rossi saw his lead over Power erode to 5.5sec, but once past, the leader was able to turn 214mph laps and pull away once more as it was now Power’s turn to encounter the lapped traffic. By the time Power was clear, he was 12.5sec down. Bourdais passed Veach for fourth at the start of Lap 64, and was swiftly pressuring Newgarden who was now the driver being held up by Chilton and Daly. Andretti and Leist made early second stops, on lap 66, with Andretti taking on much more front wing to combat the understeer that several drivers including Dixon had complained of. Dixon was the next man in on Lap 68, and he short-filled and escaped into clean air, and the frustrated Newgarden also pulled in early. 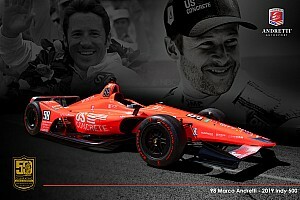 He emerged into Dixon’s path, and when the Ganassi driver lost momentum trying to pass, Andretti jumped them both. However, Dixon did get around Newgarden for fourth, and stayed close to Andretti. Rossi pitted on Lap 71 – as did Pagenaud – while Power halted on 72. He had front and rear wing adjustments and they appeared to make a difference. The #12 Penske immediately set its two fastest laps of the race, although he still had an 11.3sec disadvantage to Rossi, while Andretti and Dixon were 10sec back. Newgarden, Bourdais, Veach, Pagenaud, Carpenter and Leist completed the top 10. Veach had suffered a long pitstop after losing his quick wing adjuster, and his crew were obliged to crank in more front wing with the ‘old-style’ key. Rossi’s efforts to lap 10th-placed Leist as the race approached half-distance was a long struggle, allowing Power to close within three seconds, although the 2014 champion still had to clear a battle between Jones (two laps down) and Rahal (four laps down). The third round of stops began with Carpenter on Lap 97, followed by Andretti on 98, Leist on 99 and Pagenaud on 100, Veach on 101, Dixon and Newgarden on 102. Andretti again got around Dixon, while Rossi and Power stopped behind Chilton, which effectively bottled them together. 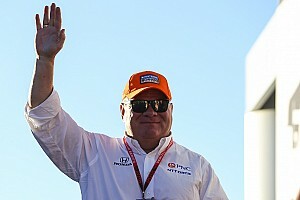 Both the Penske and Andretti crew, in adjacent pits, were put under review – Andretti for leaving an airjack hose in Power’s way, Power for driving over it as he left the pits. Will was given a monetary fine and warning for hitting a rival team’s equipment. In the mean time, Rossi was now pulling clear of Power once more, despite briefly sitting in the wake of Carpenter who was determined not to be lapped. Twenty seconds back, Andretti, Dixon and Bourdais were battling over third, but Andretti was receiving instructions to save fuel, having been the lead runner who’d stopped earliest. Another 1.7sec back, Newgarden was struggling to hold off Veach. Pagenaud running eighth, had Rossi in his mirrors by Lap 120, and the #22 car’s lesser pace started backing Rossi toward Power. The gap reduced to little more than one second, before Pagenaud (and Leist) pitted on Lap 131. So too did Andretti, elevating the Dixon-Bourdais-Newgarden-Veach battle to third through sixth. 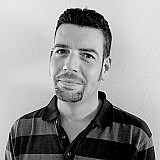 With clear air, Rossi sprinted hard, setting the fastest lap of the race – a 215.850mph – to pull a two second gap over Power. Newgarden and Veach pitted together on Lap 135 although their order didn’t change. Rossi made his penultimate stop on Lap 136, with Power stopping on 137 and the #12 crew got their man out in front. However, Rossi took just a couple of laps to find his way around Power down the inside into Turn 2 as they both trailed fifth, sixth and seventh placed Newgarden, Andretti and Veach. Veach let teammate Rossi lap him on lap 146, and Andretti did the same just a couple laps later. 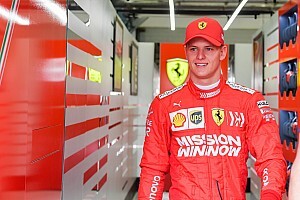 Would Newgarden do the same? No, but Newgarden’s failure to get around Chilton eventually allowed Rossi to lap him, 156th time around. Rossi wasted no time in getting around the Carlin car. With Power still unable to get around Veach and Andretti – who in turn could not lap Chilton – Rossi’s lead quickly opened out to six seconds. Daly had to pit after trying to get around Carpenter and striking the wall, while Newgarden and Andretti stopped on Lap 167. Rossi made his final stop on Lap 169, when his lead was down to 1.7sec, while Dixon stopped from third place on the same lap. Power went two laps longer but had a horrible in-lap, understeering up the track toward the wall as he caught Max Chilton’s slow Carlin car. By the time the Penske driver emerged from the pits, Rossi’s lead was back over six seconds. By the time Power got around Jones’ Ganassi car, Rossi led by 8.3sec. Power set his fastest lap on 181 and again on 188, but the race for the lead looked all-but over. Further back it was more promising however. Half a minute off the lead, Dixon was working hard to hold off Bourdais while a further 30sec back, Newgarden was under pressure from the Andretti cars of Veach and Andretti. Dixon held off Bourdais to take third, while Newgarden beat Veach, Andretti and Pagenaud. Charlie Kimball delivered another top-10 finish for Carlin, with Carpenter beating and Leist and Jones. With three races to go – including double-points Sonoma – Dixon now has 530, with Rossi on 501, Newgarden 464, Power 449, Hunter-Reay 411.